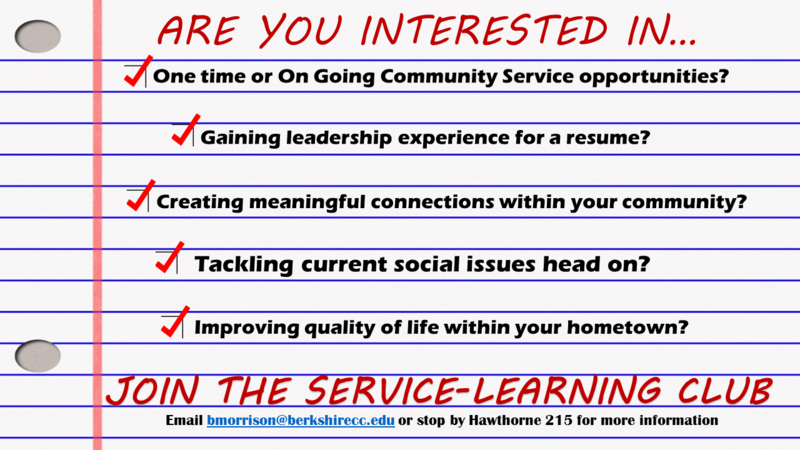 The Service-Learning Club is a great opportunity for students to get involved with helping their communities. The Service-Learning Club offers one time service projects. 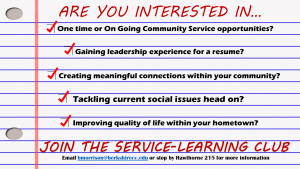 Our Club is a great option for students who might be too busy to do a continuous Service-Learning project, are not enrolled in a Service-Learning course, or who would simply like to serve on a one time basis. Our Service-Learning Club projects are very diverse and we are always looking for recommendations! November 2014: Hosted a Home Revitalization with Central Berkshire Habitat for Humanity. November 2014: Held a forum to educate students on Humanitarian Mapping with Open Source Maps to digitally map parts of West Africa that were effected by the Ebola Virus. December 2014: Invited Peace Corps volunteer Kate Schedel to talk about what The Peace Corps has to offer BCC students. December 2014: Hosted a Parent Power meeting to focus on Childhood Literacy in The Berkshires. January 2015: Helped host the 2nd Annual Dr. Martin Luther King, Jr. Day of Service in Pittsfield.